WIN House just hosted its 28th Annual Win FORE WIN Women’s Golf Tournament and we are happy to announce it was a huge success in all manners! We welcomed 144 inspirational and influential female golfers, partnered with amazing sponsors, and most importantly, raised almost $40,000 for the three Edmonton WIN House emergency shelters for women and their children fleeing domestic abuse. It was a Win for WIN! There is no way we could even begin to support our cause without the help and tremendous support of those that match our drive to empower women facing abuse and trauma in their own home. We feel extremely fortunate each year to be able to call upon our wonderful corporate sponsors and friends to help fill the golf roster, provide an auction item, engage personally with the guests, and support us financially so we may make our goals and continue to change and save lives. While the list is long, we would like to especially thank Who Cares Wear for once again coming on board as one of our valuable sponsors. Since 2015, Michelle Bessette, Founder and Owner of Who Cares Wear, has supported the Win FORE WIN Women’s Golf Tournament and this year was no different. When asked, she immediately agreed to become the Golf Cart Sponsor again for the day at a cost of $3,500. This meant that each team was given a cart to use for their comfort, enjoyment, and ease for the whole day. No need to schlep golf equipment on foot, thanks to Who Cares Wear! In addition, she and her team from all three Who Cares Wear locations – Jasper Avenue, South Edmonton, and St. Albert – provided us with Who Cares Wear discount cards for each of the golfer gift bags, donated a lovely (and much coveted) auction item, and sent a foursome of store managers and employees to play the tournament! “Thank you” seems like such a small effort on our part to show how much we truly appreciate our relationship with everyone at Who Cares Wear. But for the women and children who come to us in their time of need and trauma, “thank you” is what they feel. Because of supporters like you we are able to provide our clients with the basic needs of a warm bed, nourishing meals, medical, housing and legal referrals and resources and much more. We are able to shelter all of these Women In Need. 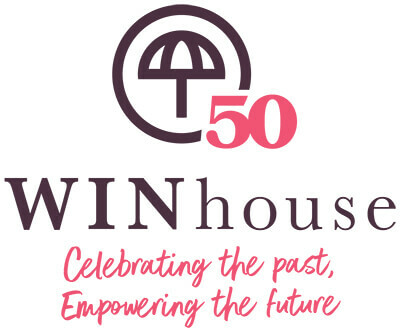 So, on behalf of the staff, board members, women and children of WIN House, we thank you Who Cares Wear. Thank you for joining us in our relentless mission to end domestic abuse once and for all. And thank you for helping to provide the means to guide these wonderful people to a life free from abuse.